D. Carry 7 days provisions "later 4 days"
The class was completed at an average cost of £137,000. On trials with a displacement of 1,000 tons a speed of 33 knots was achieved. The complement was 5 officers and 56 men. 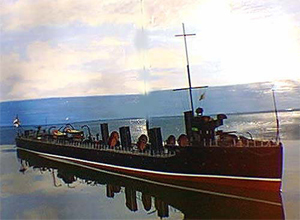 The models are based on the period after the original ships' sea trials, when a number of modifications were carried out. To this end all ships were changed – up gunned to 2 x 4inch guns forward funnels lengthened so that fumes cleared the bridge, turtle decks removed to a standard fo/castle. This gave the ships the classic destroyer outline. The base of these models is a one piece vacformed or moulded fibreglass hull with all superstructures and decks in 1mm plastic, for one glue construction. These models are designed with the beginner in mind and as a good starter to the world of warship modelling. They embody all the excitement of the building and driving of a warship without the task of constructing a full fleet model. The simple structure on the decks of these ships makes for very quick construction and with all funnels and boats in vacformings, allied with a full set of fittings in cast light alloy and cast plastic makes for an attractive model. These ships have all the performance of their bigger sisters and have one of the most outstanding sea keeping qualities of all the models in the range. As the choice of motor and couplings is very important in the construction of these ships they can be supplied with the kit on request.